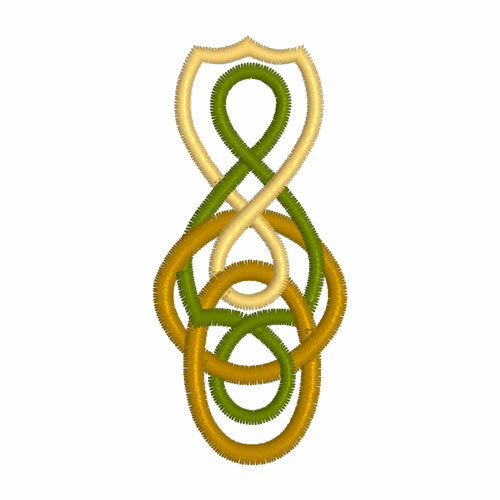 My very first attempt at digitising was a Celtic design. This type of embroidery fascinates me. 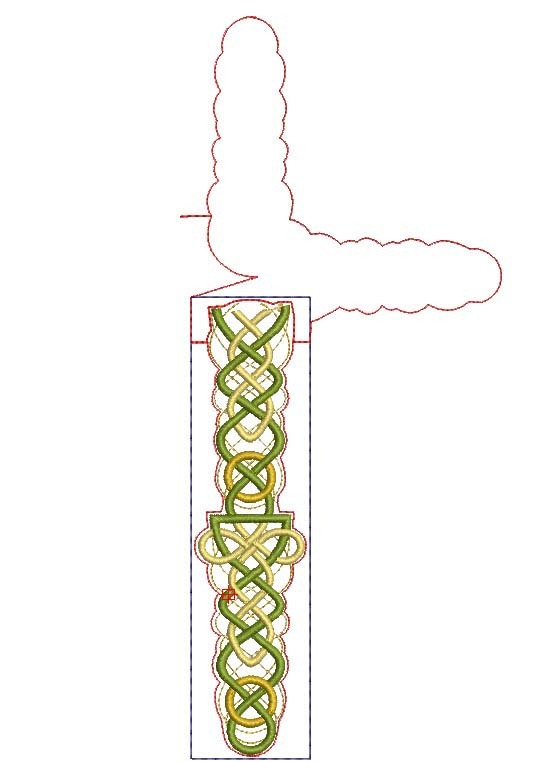 It has its own unique demands, which are that the satin ribbon work that interweave under and over throughout the whole or most of the embroidery, create the perfect Celtic Knot work. Each March, before St Patrick’s Day, I like to release new Celtic designs in time for my Celtic Event. This year I have created some large multi coloured Celtic Crosses as Easter is just a few weeks away too, and I have been asked many times to design some. My new embroidery uses a different method of stitching out which I prefer. The tiny under sections are stitched out first and the main ribbon work filling in between them is then embroidered. This requires some jump stitches but I prefer the finished result. 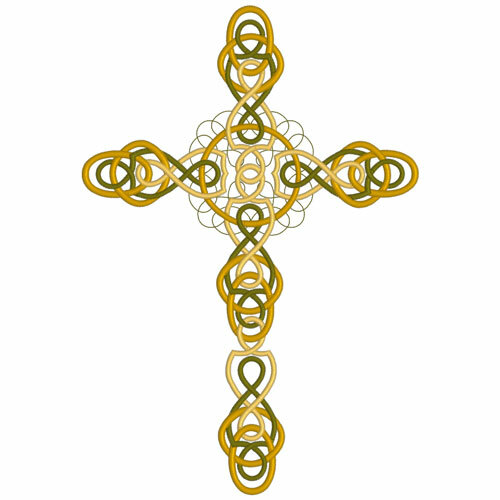 As well as the challenge of correctly producing the Celtic knot work I have adapted these crosses not just to be stitched out in one hooping within a 12″ by 8″ hoop or as a equal armed square cross in your 8″ x 8″ hoop, but also to be embroidered in several hoopings if you do not have this size of hoop. Obviously my Outline alignment stitches (OAS) will help you to achieve this easily. There is a great deal of information and help in the accompanying PDF tutorial which comes with the designs. Guide lines for matching each design have also be included within the OAS. 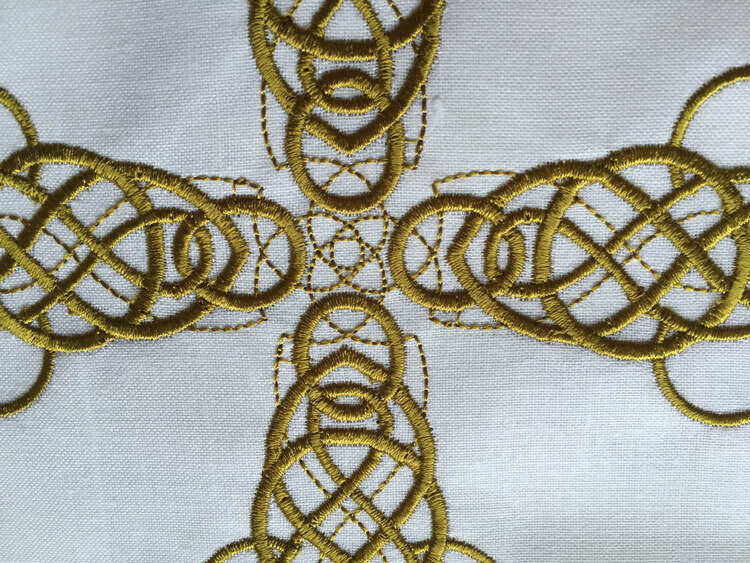 My first cross has some simple running stitches behind the Celtic knot work. 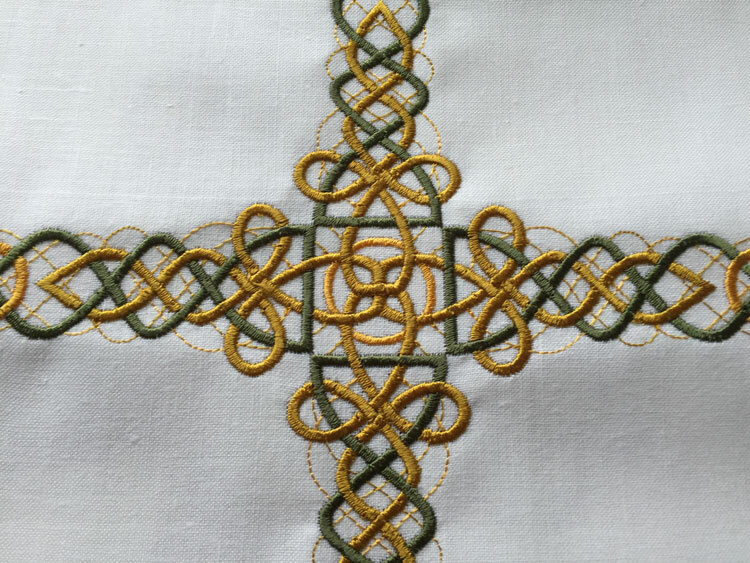 The second cross features running stitches in the main cross over area, which most Celtic crosses contain and this gives a different look. This is my favourite cross which has 4 colours ways and lovely ends. The final cross in this set has narrow knot work which does not weave under and over. 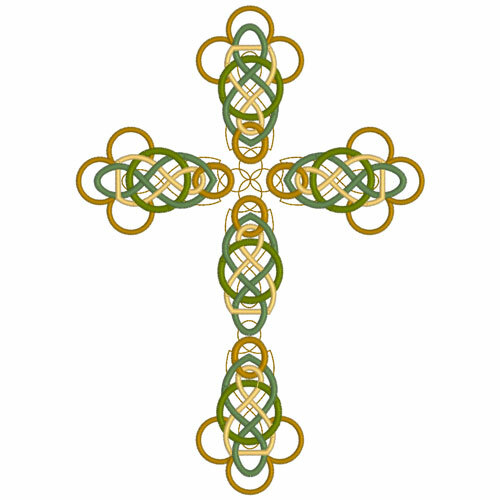 It is a much simpler cross. Until I began this project I had no idea of the amount of different crosses and their significance. The crosses take on a different look when they are stitched out in just one colour. The smaller designs which are sections of the crosses have been prepared so that you can embroider the crosses with medium size hoops. When preparing these smaller designs it was not my intention to prepare smaller designs for use on their own, although some are suitable for this but not all of them. In testing out these designs I have found that they are not too dense and can be safely laid on top of each other where they overlap. Naturally the very best look comes with the largest of the designs, the complete crosses as there is some compromise with stitching out in segments. I did experiment with some of the small designs and managed to create other crosses with them, and was also able to extend the length of the lower arm of most of the crosses successfully too! I hope you like these Celtic crosses and must say I have a few more to finish off at some point. This set for mixed hoops will be released very shortly. In the meantime make sure you download the freebie so you can test out my work. 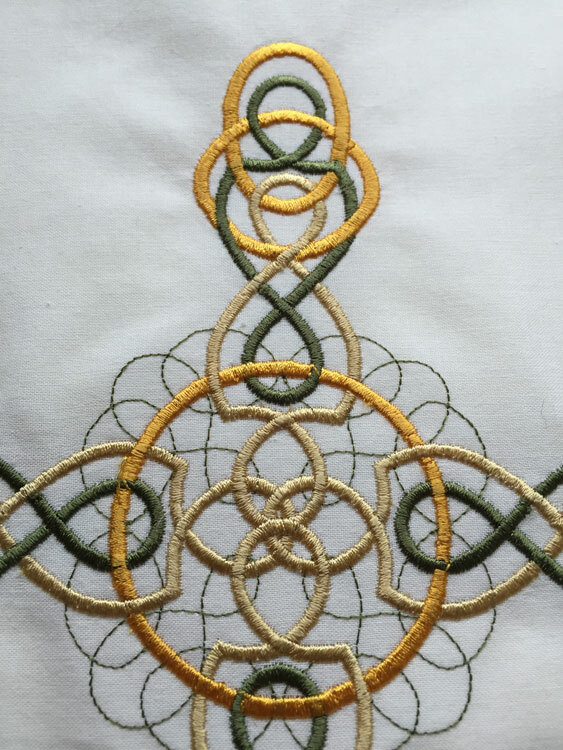 This entry was posted in Discussing machine embroidery, New Designs and tagged Celtic Designs, combining embroidery designs, development of embroidery, Easter, machine embroidery, Outline alignment stitches. Bookmark the permalink. Thank you for this lovely design. The photographs portray definite depth to the patterns. I just purchased the 8″x8″ hoop for my machine, and am delighted that you are incorporating some designs for this size. I like all your Celtic designs! 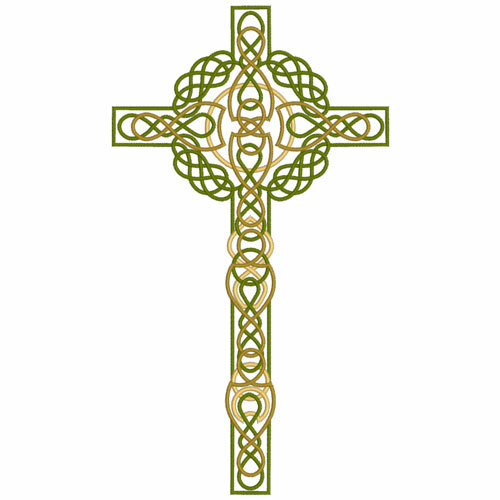 Thanks so much for providing a freebie Celtic design. I enjoy visiting your site and am so grateful that you now have the silk sampler tutorial for sale. I admired that two years ago and asked if you would eventually sell it. Thanks for sharing your talent with us.